I’m happy to have a short article in the current issue of Advertising Age. It’s a look at the over-use of QR-codes in ads, and it suggests that sometimes a giant stuffed rat just works better. I’d like to add a few comments, starting with a photo of the rat in question, which stands around 30 feel tall. The union guys who use him to call attention to their protests just love this mechanism. After all, sanding around handing out flyers can get dull. 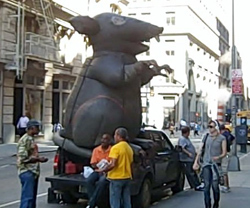 Having a 30 foot tall rat just up-levels the whole effort. Great advertising campaigns share four common elements: the are tangible, approachable, personal, and memorable. The stuffed rat and the guys with it worked on all those levels. A QR code as a central creative element just doesn’t work. Its not the code’s fault. Too often, short-sighted use dooms the QR code, regardless of how great it is. QR’s in the subway where there’s no mobile signal, or who don’t lead to mobile optimized pages, or who don’t create a clear motive to use the code in the first place, will fail. They’re bad marketing. Putting QR’s on urinals, where I hope never to see cameras, or on my dessert (yes, really) is wearing the novelty away. Beyond silly use by marketers, there is a problem with this mechanism. It isn’t convenient enough to be a great mass market connecter. In the article, I compared QR codes to their failed predecessor, the CueCat. In fact, my new favorite digital strategy friend, Lee de la Houssaye, wrote a post extended this idea, that QR Codes are CueCat2.0. Sure they do. But research from Japan, where QR codes have wider use and maturity, shows that of those who use them, the average is less than two uses per week. And in those cases, the overwhelming reason they used the code was to get a coupon or discount. If customers only opened two email messages per week, or answered two phone calls per week, that would discourage making them the core of many mass marketing campaigns. Unless they arrive with a great discount, or attached to a great rat, they eventually won’t get noticed. 4 Responses to "QR Codes and Giant Rats: My Article in AdAge Stirs Debate & Approval"
QR Codes - Are they a waste of time? QR Codes work extremely well when used in the right way for the medium. We have a mobile based CRM for Book Publishers to enable them to discover their reading audience, this is done through scanning QR codes on the book jacket to ‘unlock’ bonus content. We’re seeing on average a 12% unique Click-thru rate to the number of total books sold. 1 title in particular has sold around 300k copies and we now have close to 60,000 people in the database for that one campaign as a result. We’re also still seeing on average 600 new people a month scanning the code on the book. That’s 600 a month, 2 years after the book was first released, how’s that for a long tail! QR Codes work better than anything else when used in the right way and in the right medium. Love this post! Why is it that we continue to believe that “more” is better and “over the top” is best? In an effort to look “cool” we adopt what’s new without knowledge or understanding. Case in point, I was on a conference call yesterday with a guy who was complaining that he didn’t know how to open up his meeting agenda on his spiffy new iPhone. Yes, he sure looks cool, but his execution and his tech ROI just doesn’t measure up.